Affect is a high-stakes topic in psychoanalysis, but there has long been a misperception that Lacan neglected affect in his writings. We encounter affect at the beginning of any analysis in the form of subjective suffering that the patient hopes to alleviate. How can psychoanalysis alleviate such suffering when analytic practice itself gives rise to a wide range of affects in the patient’s relationship to the analyst? 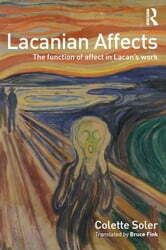 Lacanian Affects: The Function of Affect in Lacan’s Work, is the first book to explore Lacan’s theory of affect and its implications for contemporary psychoanalytic practice. In it, Colette Soler discusses affects as diverse as the pain of existence, hatred, ignorance, mourning, sadness, "joyful knowledge," boredom, moroseness, anger, shame, and enthusiasm. Soler’s discussion culminates in a highlighting of so-called enigmatic affects: anguish, love, and the satisfaction related to the end of an analysis. 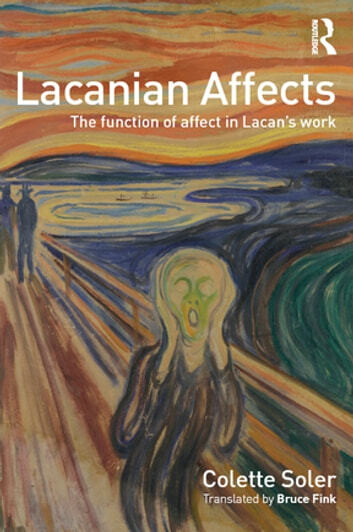 Lacanian Affects provides a unique and compelling account of affect that will prove to be an essential text for psychoanalysts, psychiatrists, psychotherapists, psychologists, and social workers.